Have you tried and struggled getting your dog to be a good canine citizen? Perhaps you want a well-behaved dog, but don’t know how to train. Maybe you’re just simply too busy. Well, we can help. Our Boot Camp is a 10-day course of general obedience. Your dog will be worked by all of our staff, multiple times daily. This ensures the dog will listen to everyone , not just one trainer. Your dog will be worked indoors and outdoors. We strive to add distractions, because life is all about distractions. Included in the Boot Camp is a Garmin Sport Pro training collar. After doing a proper collar introduction, we will utilize this tool to train as well. Upon the final day of Boot Camp, you will be asked to devote some time to come train with us and your dog. We will cover the ins and outs of what transpired over the course of 10 days, problems we worked your dog though and how, and what your family can do going forward to keep up on the training. 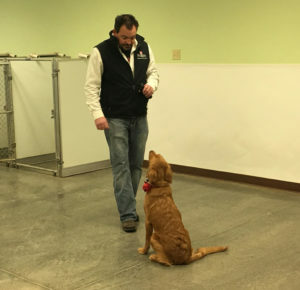 Millie learns that paying close attention is important to over-all obedience. 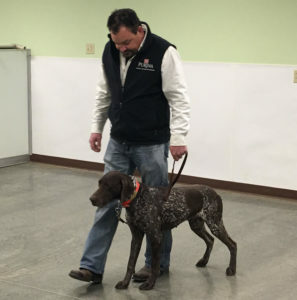 Rebel gets in some heeling practice. We have many references and testimonials and below are a few. If you have further questions or wish to schedule a Boot Camp for your dog, please give Linda or Sean a call at the Kennel. We were having issues with our 10-month golden retriever Bella. She was not good at listening and very food possessive. With running out of options we were hoping that having her spayed would possibly help with her temperament. With having two kids it’s just not an option in our house. I, of course, asked around for ideas as I didn’t want to give her up. But I also didn’t want the kids to get hurt. 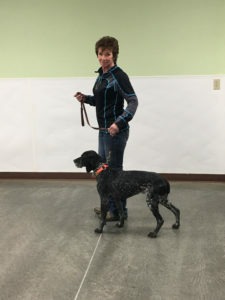 We heard about Sean and Linda at Spring Valley Kennel in Blue Mounds and training. Both Sean and Linda were very helpful and there was no pressure, honest and to the point. After 2 weeks with them honestly, Bella was a different dog. She listens a lot better. She still has her days, but they are normal puppy days. We haven’t had any temperament issues and counter surfing. I can’t say enough about Sean and Spring Valley Kennel. Just a great place and a great group of people. I had just gotten a Lab puppy and I thought I’d train him; yeah right, with three boys and another dog in the house. I contacted Sean and he told me to let Hank get a little older and we set up a date to have him go to boot camp. All I can say is when I got there to pick Hank back up, it was a night and day difference; he was collar trained and listened perfectly! I was very impressed they took very good care of my boy Hank while he was there. I highly recommend them and their boot camp.